Don't get me wrong, there are some good things about the United States. I'll even say there are some great things about this country. We're the largest economy in the world, have high life expectancy, good education system, etc. That said, geography has never, ever been the strong suit of people in the United States. Maybe it's because we've been the strongest nation in the world for a good little while now, and we feel like we don't need to know about geography. Maybe it's because, unlike Europe, most people in the US don't live anywhere near a foreign country, and even those who do likely live near only one--either Mexico or Canada. Consequently, we're just not really forced to learn much about the geography of other parts of the world. Hairdresser: "Oh, I have a niece who almost relocated to China for her husband's work!" Me: "Oh really, any idea where they were going relocate?" Hairdresser: "I forgot the name of the city in China... started with an "S" I think!" H: "No, that doesn't sound right"
H: "No, none of those sound familiar either"
Me: "Did they move to Seoul?" H: "No, don't think it was Seoul"
H: "Oh, yes! That's where it was they were going to move in China. Singapore!" At this point, those of you who know me well will understand what I mean when I say I did the "Blaine Curcio smacking himself in the forehead then running his hand down his face in a semi-exasperated show of disgust". I hate to alienate one of my 3 readers by insulting their intelligence, but if you don't understand what's just happened, you should probably get out of the house (or country) more. In short, Singapore is a SEPARATE COUNTRY FROM CHINA ENTIRELY. It is not only a completely separate country, but geographically, it's NOWHERE NEAR CHINA! 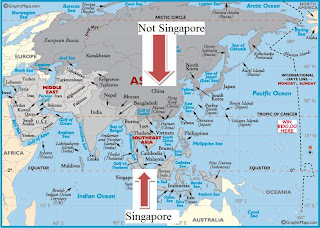 Now granted, Singapore is far closer to China than, say, Chicago. But it's still like a 3.5 hour flight South from Hong Kong, which itself is in a very far Southern part of China. For reference, it's about as far from China as Colombia is from the United States. That's pretty far. As in, >1,000 miles. Granted, Singapore is full of ethnic Chinese, but come on now. I ended up just playing along, and saying how great Singapore is (which it really is, one of the coolest cities I've been to), and didn't really have the heart to tell her how freaking incorrect she was. 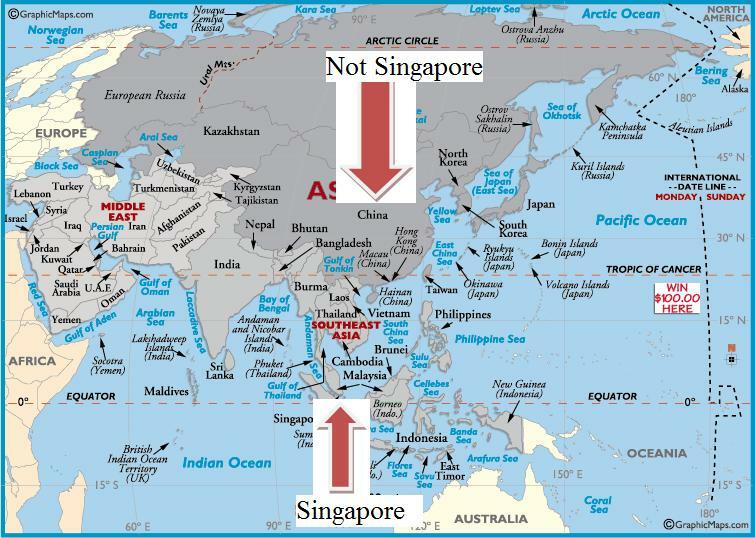 Regarding the map on the left, the "Singapore" label is covering up the scale, but the entire map is approximately 10,000 miles west to east and 7,000 miles north to south. i.e. Singapore is really freaking far from China. At any rate, my God, welcome to the United States of America. Land that needs more geography majors.